When purchasing Microsoft Office software, an installer CD is no longer provided with the license key as in the past. Instead, a card with a license is provided and the software then needs to be downloaded over the Internet. Most users have Internet service that is fast enough for this to happen within approximately 20 minutes so downloading the software is not the issue to be concerned with. The issue to be forewarned about is knowing which Microsoft Office installer link to use when the only identifier is the Office software version and date the license key was registered. This means multiple licenses for the same software version registered under the same Microsoft account on the same day are nearly impossible to tell apart. 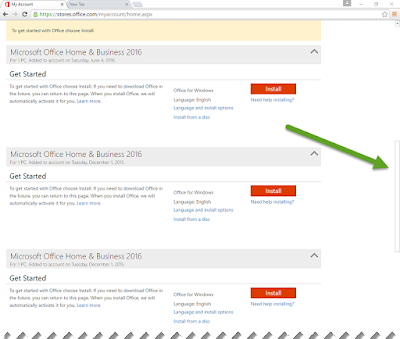 When more than one license is purchased it can be difficult to choose the correct Microsoft Office installer link because a registered license does not appear under the Microsoft account. Instead, the name of the Office version and the date of the license registration is shown next to the installer. When the wrong installer link is clicked, the software is unable to be registered after being installed. This post applies to purchasing multiple Microsoft Office licenses for the same software. It does not apply to volume licensed software or to Office O365. 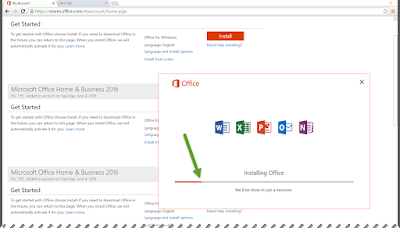 Following the process below will help you successfully choose the correct Microsoft Office installer so as to avoid running into any license registration issues. As listed above, go to office.com/setup and type in the license key. When prompted, select the country and language associated with the license key. Sign into a Microsoft account the software will be registered to, or create an account if necessary. Once logged into the account, click the link for the installer for the first copy of Office. For the second license, pay attention to where the web browser window is positioned when the screen listing the licenses and installers is located. Notice in this image how the scroll bar is half way down the page. Do not scroll the page because the installer you will want to use is the one listed just below the yellow ribbon. The same window scrolled up looks like the image below. Notice that the yellow ribbon to get started is below 3 other install buttons. 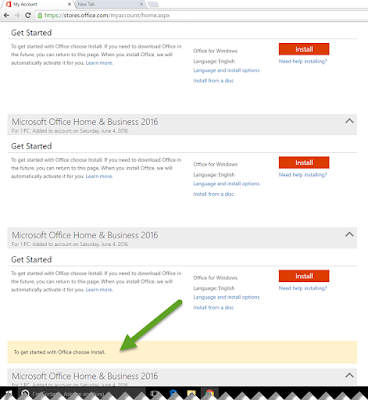 The important thing to know is to select the Install button below the yellow ribbon stating "To get started with Office choose Install". Once the Install button is clicked, the software will begin to download. Once the download has finished, depending upon the web browser being used, click on the executable file to begin the install process. When the install starts, you will see the Office window letting you know things are starting. Within a few minutes, the software will begin installing and a progress meter is displayed to show the installation progress. Once the software has finished installing, enter the license key a second time so the software can be registered. If the wrong installer link was selected, this will fail. In the event of this, call the support number and follow the automated voice messaging to enter in the correct license key and successfully register the software. 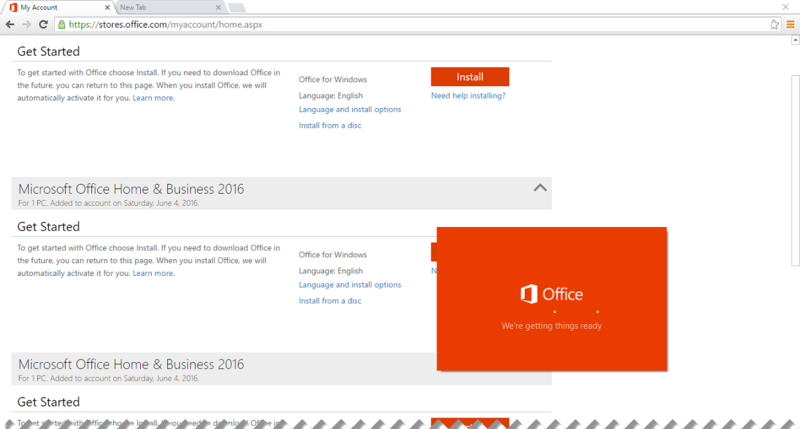 Anytime multiple Microsoft Office licenses are registered to the same account in the same day, knowing which installer link is the correct one to use can be tricky. When the wrong link is clicked, the software does not need to be reinstalled, but an additional phone call to manually register the license key is required. To prevent this, simply click the link under the yellow ribbon regardless of where in the Get Started screen the yellow ribbon appears. For some people the new way of installing Microsoft Office will make them long for the good old days when purchasing software meant you actually received a physical copy of software. While this is not the case for many software vendors anymore, knowing how to work around the quirks is most helpful! 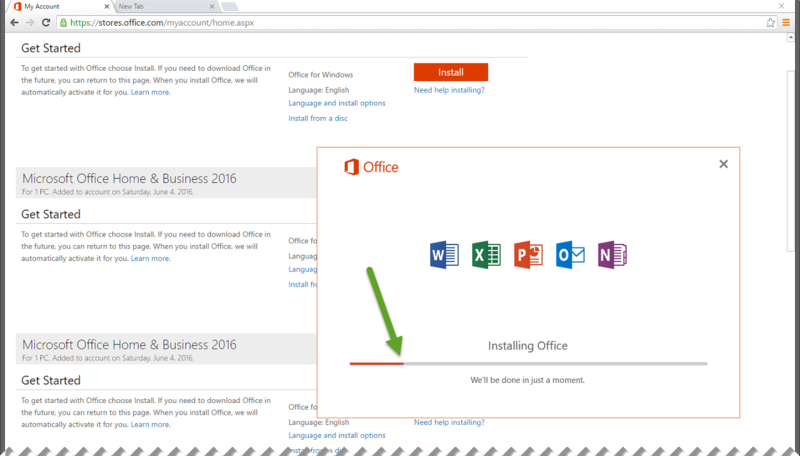 It’s really helpful information given in this blog which tells us clearly that how to choose correct Microsoft office installer apart from it if you face any query or you are not able to make it correct then just dial our Microsoft office phone number which is made to resolve the user issue which become the headache for the user just meet us on this number or erase the technical problem.